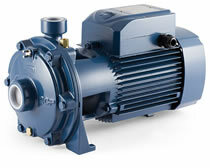 High efficiency, quiet running pumps with long even curves. Suitable for continuous heavy duty service in domestic, agricultural or industrial applications. These pumps are suitable for handling clean water and fluids which are not chemically aggressive to the pump components. They are an obvious choice wherever there is a need for high head values hard to reach with single impeller pumps. 2CP SERIES PUMPS ARE EXTREMELY RELIABLE, SIMPLE TO USE, QUIET AND VIRTUALLY MAINTENANCE-FREE, FINDING MANY USES IN DOMESTIC, CIVIL AND INDUSTRIAL APPLICATIONS, PRESSURE BOOSTING, BOILER FEED, COOLING SYSTEMS AND FIRE-FIGHTING UNITS. Cast iron SUCTION BODY with UNI ISO 228/1 gas threaded suction and delivery port. Cast iron DELIVERY BODY with UNI ISO 228/1 gas threaded delivery port. BRASS IMPELLER, centrifugal radial flow type. AISI 316 stainless steel MOTOR SHAFT (AISI 416 up to 0.75 kW). MOTOR: pumps are coupled directly to an asynchronous, high efficiency PEDROLLO induction motor of suitable size, which is quiet running, closed and externally ventilated, suitable for continuous duty. A thermal cutout relay (motor protector) is incorporated in single phase motors up to 1.5 kW. CONSTRUCTION AND SAFETY STANDARDS in compliance with EN 60 335 -1, (IEC 335-1, CEI 61-150), EN 60034-1, (IEC 34-1, CEI 2-3).